NPQ will not publish regularly on July 25th, 2012. Instead, we want to impress upon you how much and how immediately NPQ needs your help. We must raise $250,000 before August 31st. 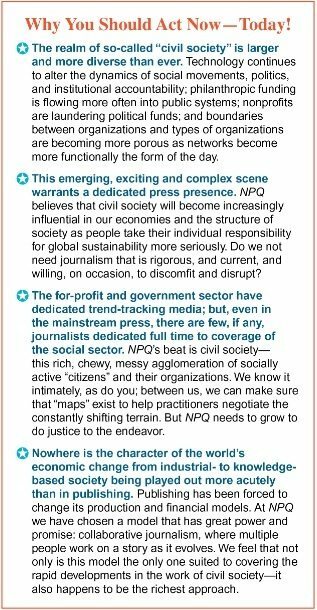 We feel privileged to be a part of NPQ—we are participating in an historic moment: the social sector will grow and change increasingly quickly and figure increasingly prominently in the shaping of the world’s future over the next two decades. And there is no other significant journalistic presence capable of comprehensively tracking developments in and around this sector. Your work deserves the respect of a dedicated press. NPQ is that press. To step up to that challenge, NPQ has remade itself over the past three years. We are not your mother’s NPQ. Our pace has accelerated manyfold. The breadth of our coverage has increased to mirror the way the sector and its environment are changing. Our circle of readers and contributors has grown enormously. To make this expansion possible in a time of scarcity, we have moved to a fairly radical collaborative journalism model that allows us to expand our content offerings well in excess of what we could otherwise afford to do. Collaborative journalism engages NPQ’s readership community as correspondents, multiplying and diversifying the eyes and perspectives through which we collectively interpret the vivid and rapid developments around us. But we need to match the reporting model to our financial one. This is where your support becomes critical. Please act as if you are the only one on which NPQ can depend—because it is true. Although our long-term prospects are hopeful, we need a bridge that only you can construct. Give today and give generously, and anything you give will be doubled. Join NPQ in bringing the acts of making and writing history together.